We’re looking forward to a busy summer of Read Not Deads at Shakespeare’s Globe, a playreading marathon at the Shakespeare Institute, and workshops with The Dolphin’s Back. Rounding off the dog days is our conference, 24-27 August, at the University of Roehampton. 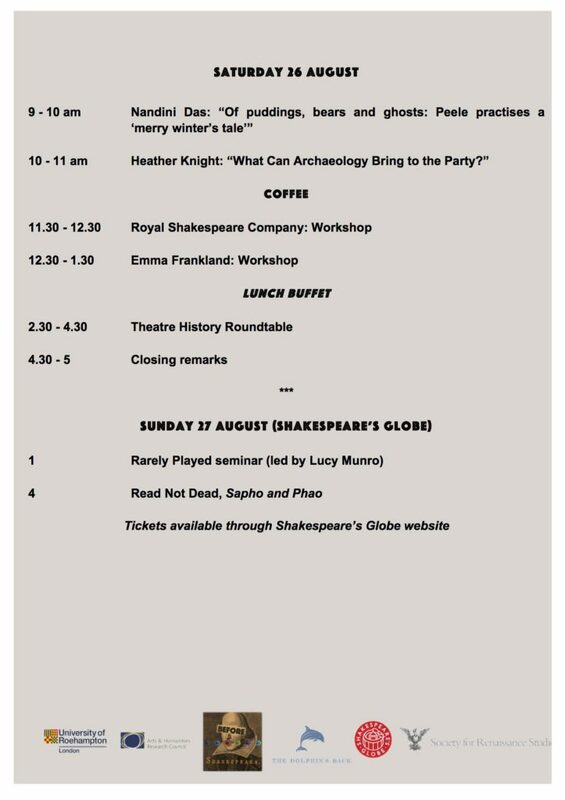 We recently released the schedule on our website and are very pleased to offer three packed days of talks, workshops, and dialogue followed by a staged reading of John Lyly’s Sapho and Phao at Shakespeare’s Globe on the Sunday (the last of our Read Not Dead season), preceded by a Rarely Played seminar led by Lucy Munro. Tickets for the Globe seminar and reading are available separately through the Shakespeare’s Globe website. Our conference puts different disciplines, media, and professions into dialogue and we welcome anybody interested to register (please note that places are limited). 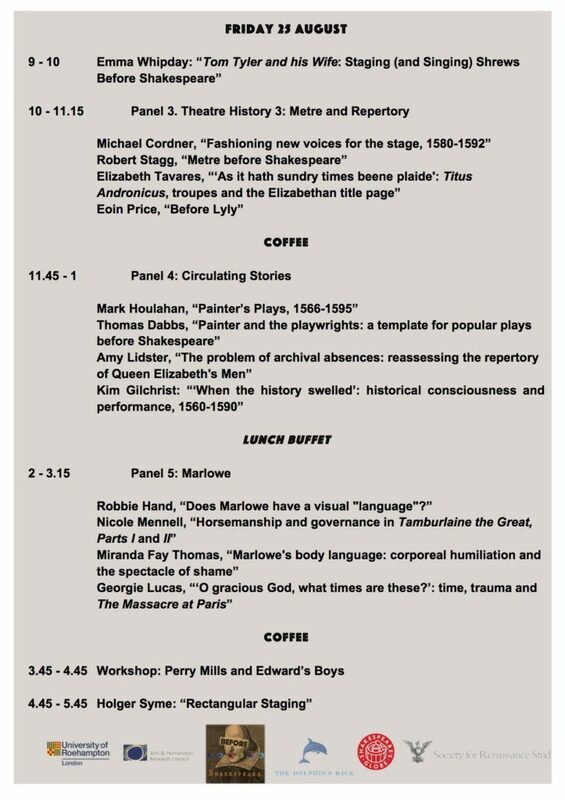 As such, we are pleased to be hosting four very different performance workshops engaging with the literature and history of Elizabethan England. The coordinator of our Read Not Dead season and the director of our Before Shakespeare workshops, James Wallace, will run the first workshop on the Thursday afternoon in collaboration with our second keynote, Cathy Shrank. We look forward to welcoming Edward’s Boys to Roehampton, fresh off the success of their latest tour with Thomas Middleton’s A Trick to Catch the Old One. The Royal Shakespeare Company will lead a workshop on the Saturday morning, followed by Emma Frankland’s Galatea session (building on workshops from last year)—a diversity-positive exploration of Lyly’s play, especially in relation to gender, transgender identity, race, and disability. We look forward to the breadth in topics of our keynote speakers. The conference kicks off with theatre history powerhouse William Ingram assessing the discipline in his talk, “What We Talk About When We Talk About Theatre History.” Cathy Shrank’s talk that afternoon examines the relationship between dialogue and drama in the mid-sixteenth-century, putting examples into performance. Our second day begins with Emma Whipday’s discussion of shrews before Shakespeare, featuring her excellent recent staged reading of Tom Tyler and his Wife (UCL, Nunn Hall, 24 May 2017). Holger Syme speaks to us on the Friday afternoon about “rectangular staging,” a talk that will no doubt set up Heather Knight’s thoughts the following day on archaeology and interdisciplinary dialogue, fresh the gravel of the Curtain playhouse in Shoreditch, where she was the lead archaeologist on the dig. Saturday begins with Nandini Das’s discussion of George Peele’s Old Wives’ Tale and the ways in which “romance, the everyday and the extraordinary become unnatural bedfellows” in the play. Our conference will round off with a reflection on theatre history itself, forming a natural bookend with William Ingram’s opening talk and a chance for reflection. 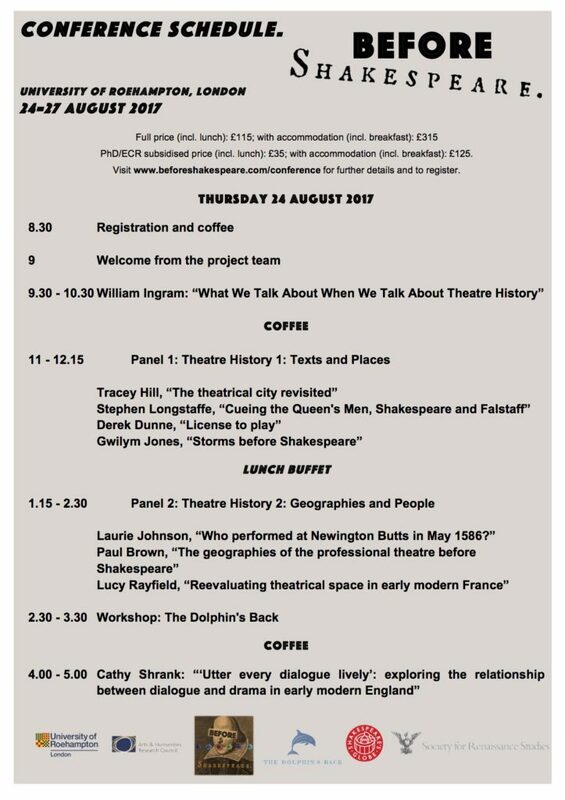 We are pleased to welcome Tamara Atkin, Farah Karim-Cooper, Heather Knight, David Kathman, Stephen Purcell, and Clare Wright to reflect on the conference and think about the state and future of theatre history. The talk will hopefully garner open discussion amongst delegates as we head into our final events at the Globe on Sunday. Last but by no means least, we’re thrilled to announce a stunning line-up of speakers and talks on a range of topics from Marlowe to metre, from prose romance to places, and from London to France. Our full schedule is attached as an image and available through our website. We are proud to be offering a significant discount for postgraduate and early career academics (within 5-years of the PhD but without a permanent role or departmental funding). There has been much important discussion in recent years, particularly on social media, about the accessibility of conferences and the difficulties of attending and participating when faced with job uncertainty and limited funds. While we would always like to do more, we have done our best to make the conference and accommodation affordable for all, but particularly for early career delegates, and we are thankful to the Society for Renaissance Studies for a small-conference grant that allows us to subsidise travel for three of our speakers. That, along with our ECR keynote in Emma Whipday and a buzzing line-up of postgraduate and ECR speakers alongside eminent names in the profession makes us hopeful that the conference will be a particularly lively, friendly, and intellectually exciting few days. Booking is available through a link on our website and any queries can be addressed to beforeshakespeare@gmail.com. We would like to thank sponsors of the conference in the University of Roehampton, the Arts and Humanities Research Council, Shakespeare’s Globe, and the SRS.